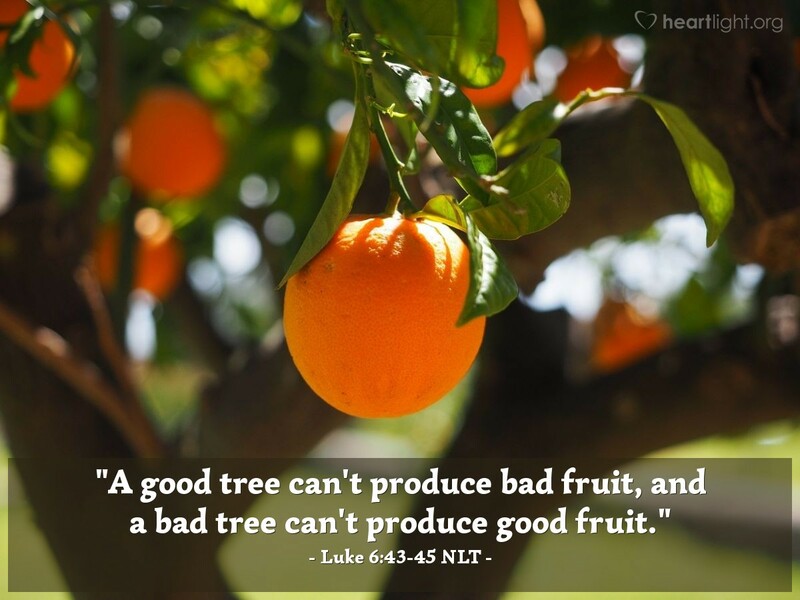 [Jesus said,] "A good tree can't produce bad fruit, and a bad tree can't produce good fruit. A tree is identified by its fruit. Figs are never gathered from thornbushes, and grapes are not picked from bramble bushes. A good person produces good things from the treasury of a good heart, and an evil person produces evil things from the treasury of an evil heart. What you say flows from what is in your heart." Ultimately, all the principles Jesus talks about in Luke 6 are heart issues. Our hearts, not just our actions, need to be conformed to God's will. Yes, our actions are crucial. Yes, obedience is necessary. However, that obedience needs to be heartfelt and heart-driven. When it is, then our hearts determine the fruit we bear. So let's ask God to guard our hearts, cleanse our hearts, and conform our hearts to his own. Holy God, purify my heart. Remove from it all bitterness and rivalry. Get rid of self-interest and evil. Fill my heart with your love by the power of your Holy Spirit. In Jesus' name, I pray. Amen.